This entry was posted in Finished Projects, Quilting on November 22, 2013 by Jo. Cute as it can be! Thanks for the pattern! I printed it off and hope to make it for a fundraiser. Cute! It’s very cute and homey. Love it. I love the table runner, so fun – it made me smile immediately! Well done for taking the time to write up all the instructions and make templates – that’s a lot of work and definitely counts as a big finish!! Thanks for the pattern Jo it is going to be a Christmas Gift. 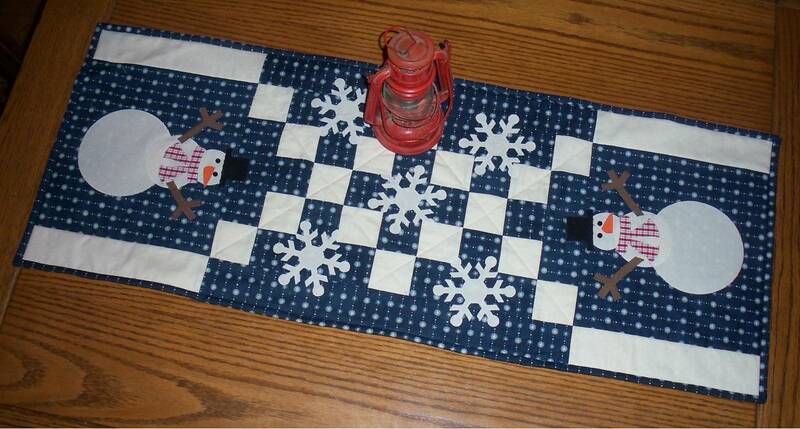 Thanks for sharing the snowman table runner — looks really cute! Darling snowman table runner. Like the snowflakes too! Thanks for a other pattern! Thanks so much for your generosity in writing the directions and sharing your adorable snowman table runner! It is actually a design that can be used all winter long – not just at Christmas! Love this pattern. I cannot get it to open so I can print it. I have adobe reader. Could you please help me? Thank you. I was just getting ready to make the Snowman Table Runner, but didn’t see the snowflake pattern. Can you tell me where you found it? It’s really darling. I didn’t know if that was one of the Accuquilt designs. I figured it must be since I don’t see the snowflake template in any of your pages. I don’t have adobe reader, how can I get the pattern ? I really like the snowman runner.